If you have an idea of what you want to do, and know some of the basics, we can help you design and develop components and assemblies to fit you application. Examples include helping a customer develop the harness for a dashboard. 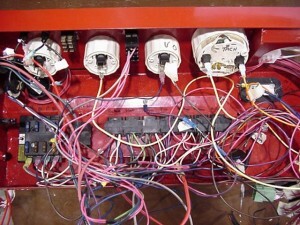 As you can see in the actual before picture, wires were run one at a time on the manufacturing line. 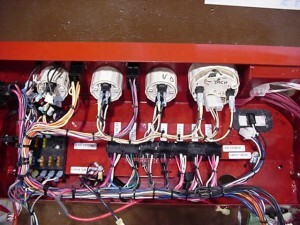 PCS provided the Engineering experience to develop a one piece, formed, “plug and play” harness that sped up dashboard installations at the customers facility. For normal production an in process testing program is developed for each product based on the complexity of the assembly. PCS can provide Design Verification and perform limited Design Validation testing as well. Let PCS provide you with a complete kit including all the components necessary for your installation. For example, on a lighting harness for a tow behind trailer, we can not only provide the wiring harness, but the lights and mounting accessories as well.